Ken Wallingford was born in 1948 in Munich, West Germany. He enlisted in the U.S. Army on May 14, 1969, and after completing basic training and advanced training at Fort Polk, Louisiana, he went through airborne training at Fort Benning, Georgia, from February to March 1970. PFC Wallingford next attended Special Forces training and Special Forces Medic training at Fort Bragg, North Carolina, from March to June 1970, followed by service as a sniper with the 22nd Infantry Regiment of the 25th Infantry Division in South Vietnam from August 1970 to April 1971. Sgt Wallingford transferred to Military Assistance Command Vietnam as an advisor in April 1971, serving in that position until he was captured during the Battle of Loc Ninh on April 7, 1972. After spending 312 days in captivity in Cambodia, he was released during Operation Homecoming on February 12, 1973. He was briefly hospitalized to recover from his injuries at Fort Sam Houston, Texas, leaving active duty on June 12, 1973, and was honorably discharged from the Army Reserve on May 13, 1975. 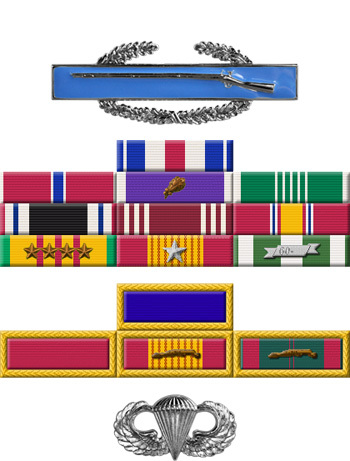 Sergeant Ken Wallingford distinguished himself during the period 5 April 1972 to 7 April 1972 while serving as Light Weapons Advisor to the 9th Infantry Regiment, 5th Infantry Division, Army of the Republic of Vietnam. On 5 April 1972, North Vietnamese and Viet Cong forces launched a major offensive with the objective of capturing Binh Long Province in Military Region 3. The 5th Viet Cong Division was targeted against Loc Ninh, the capital of Loc Ninh District in Northern Binh Long Province. The 5th Viet Cong Division launched a massive coordinated ground attack against Loc Ninh beginning early in the morning of 5 April 1972. The attack was supported by artillery and tanks. 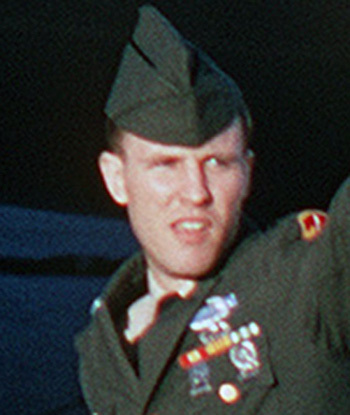 Sergeant Wallingford skillfully directed tactical airstrikes and helicopter gunships in support of the 9th Infantry Regiment and other South Vietnamese forces in the area. During the battle Sergeant Wallingford fought magnificently. Time and time again he directed the fighters, bombers, gunships, and artillery fire on top of his own position to drive off the attacking enemy. The combination of Sergeant Wallingford's courage and professional skill coupled with all available firepower kept the numerically superior enemy at bay for more than two days. Despite the valiant efforts of the defenders, the city of Loc Ninh was completely overrun by the enemy on 7 April 1972, but Sergeant Wallingford through his courageous actions extracted a horrendous price from the enemy for their tactical accomplishment. Sergeant Wallingford's conspicuous gallantry in action was in keeping with the highest traditions of the military service and reflected great credit upon himself and the United States Army.